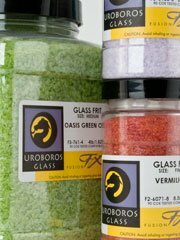 Fusion FX 90 frits are compatible with all COE 90 glass by Uroboros, Bullseye or Wissmach. Sunshine stocks a wide variety of FX 90 frits in convenient 8½ oz jars..
Water clear frits have extra clarity. Used often for "diluting" other colors of frit for casting. The added purity of water clear frit will allow the main color to show through with no muddying. 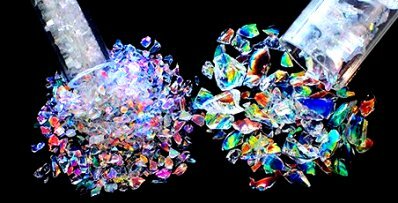 Fine frit and Powder are not made as the iridized effect is lost on the smaller grain size.